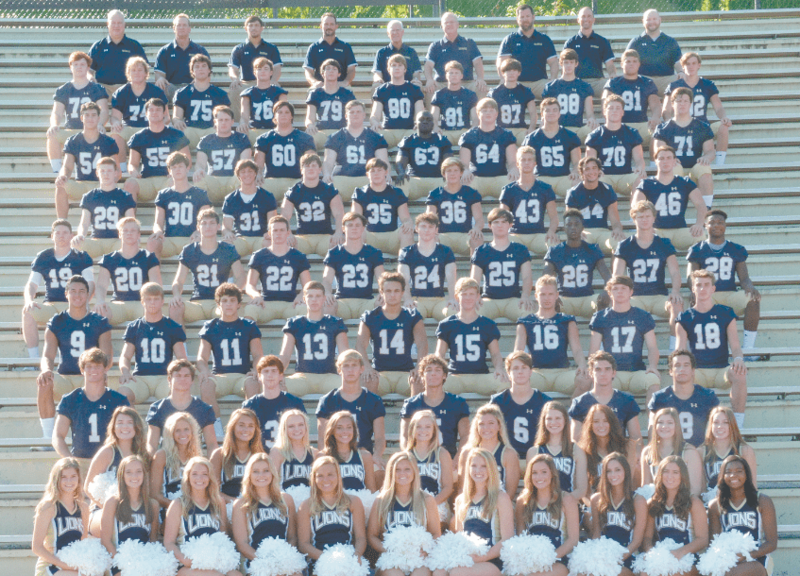 Members of the 2018 Briarwood Christian School varsity football team include: Mark Hand, Cade Mango, Brooks Donnelly, Jonah Carroll, Cal Higdon, Chase Travis, Sam Hamner, Cade Dickinson, J R Tran-Reno, Andrew Jones, Parker Hutson, Cohen Luker, Matthew McKenna, Sam Gage, Luke Hand, Eli Steadman, Mason Algren, Bryce Perrien, Jacob Burr, Blake McKenna, Andrew Hill, Cal Reebals, Jay Kynerd, Alex Key, Tyler Smith, Reid Mays, Luke Prewett, Bailey Salmon, Michael Murphy, Alaster Harris, Christian Ferguson, Tyler Waugh, Noah Nall, Quaid Rasmussen, Cole Garner, Daniel Corbin, Turner Murphy, Noah Whatley, Knox Wolsoncroft, Clayton Rasmussen, Landon Berg, John Ashton Perry-Heard, Carson McKeen, Cole Scordino, Ross Godbehere, Parker Will, Ian Davis, Alex Miller, Trent Howard, Carson Miller, Harris Smith, Colin Dorrill, Will Barnes, Chandler Key, Will Brewer, Dalton Brooks and Ian Sorrels. Journal photo by Jordan Wald. It’s tough to find room for improvement when you’re coming off of a 14-1 season. Briarwood Christian School fell in last season’s state championship game to St. Paul’s Episcopal 17-14 when the Saints scored on a fourth down with 1:54 remaining in the game. After its third title in four years, St. Paul’s now moves to 6A because of the AHSAA’s new competitive balance rule. This is a new season, he assures, and a new gauntlet awaits. The Lions have a tough schedule; they’ll play up, with three non-region, 6A contests this season. 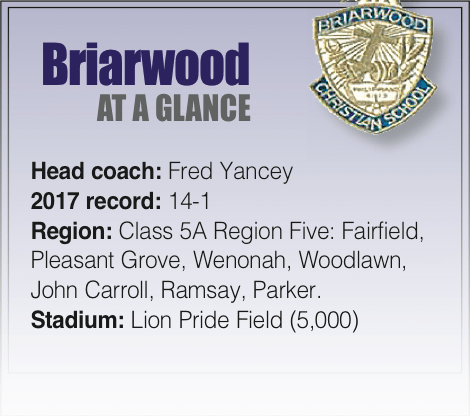 Chelsea, Hartselle and Hueytown promise to be formidable foes, while 2016 state champion Ramsay drops from 6A into Briarwood’s 5A Region 4. They’ll also face Wenonah, John Carroll, Woodlawn, Parker, Pleasant Grove and Fairfield in region play. 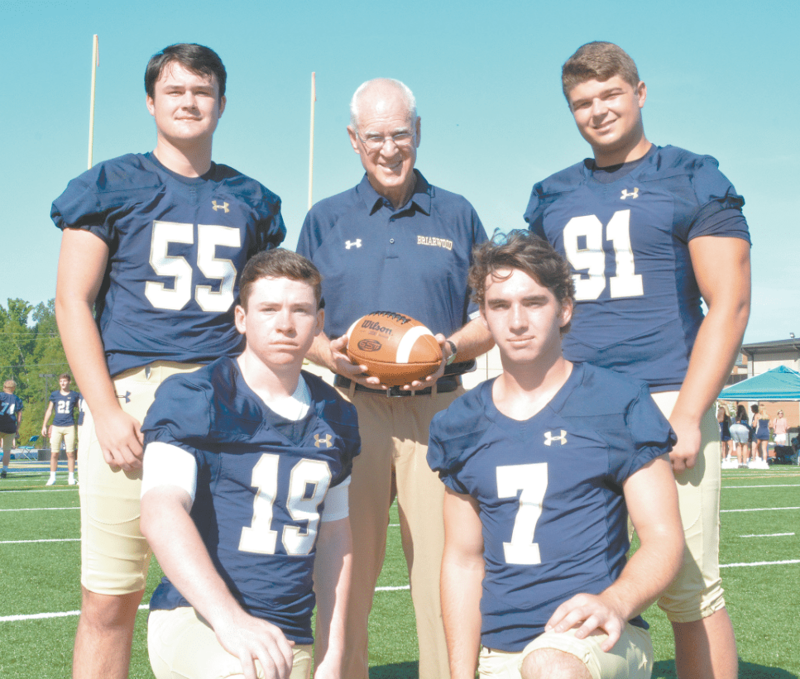 Briarwood key players with head coach Fred Yancey from left: Noah Whatley, Bryce Perrien, Sam Hamner and Dalton Brooks. 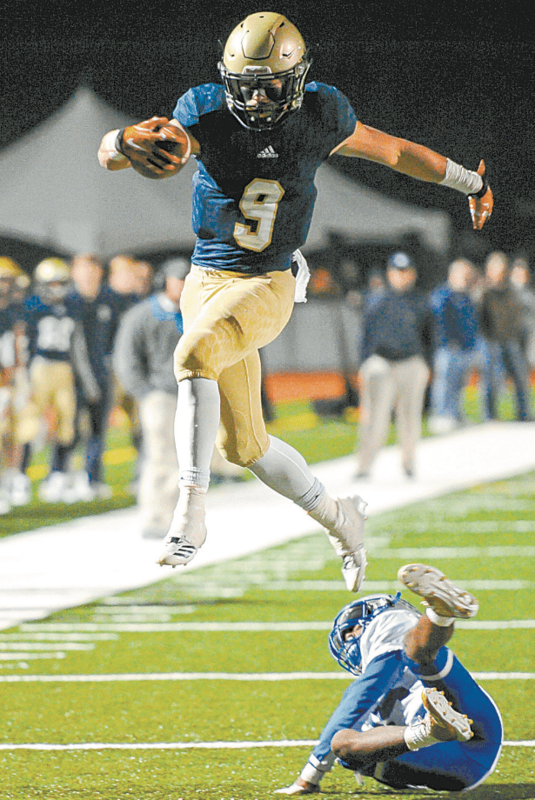 If that happens, it will begin with a major position change from Briarwood’s best athlete. Star running back J.R. Tran-Reno will move to quarterback, a move that comes after Tran-Reno verbally committed to Vanderbilt as a running back. He chose the Commodores over 28 other offers. Yancey and the Lions aren’t concerned about the 6-foot-1-inch, 210-pound senior’s ability to roam between positions. They’re most concerned about putting him in the position that gives their team its greatest shot at victory. Tran-Reno will be backed up by sophomore Jonah Carroll, a rising young quarterback whom Yancey likes a lot. Coaches like Carroll so much, in fact, they expect him to see quality game action this season. Luke Prewett will get most of the reps at running back. The 5-foot-9-inch, 186-pound junior got a lot of playing time a year ago, and he’s improved quite a bit over the summer, participating in and taking advantage of all summer workouts. The offensive line has some new faces. It also has some familiar faces in new positions, including Noah Whatley. Last season, Whatley spent time as a starter at tight end, but he’ll move inside to guard for the first time. Landon Berg was the backup center last season, and he’ll move into a starting role this season. “They weren’t starters (at their positions) a year ago, but they’ve improved and they’re big enough and strong enough now to really do some good work,” said Yancey. On the other side of the ball, the Lions welcome back many pieces of a defense that allowed no more than two touchdowns to any opponent during the regular season. Yancey expects his secondary to be a strength, led by senior Cade Dickinson. The returning starter and all-state safety offers experience and speed. Sam Hamner moves from linebacker to start at the other safety position. Cade Mango will start at cornerback for the first season, and as camp winds down, competition remains fierce at the other corner spot. Senior Michael Murphy and sophomores Alaster Harris and Cal Higdon are all competing for time, with each figuring to see playing time this year. Senior Mark Hand is a three-year starter at linebacker. At 6 feet 2 inches, 210 pounds and with good speed, he’s the prototype, and Yancey expects even bigger things from him as a senior. 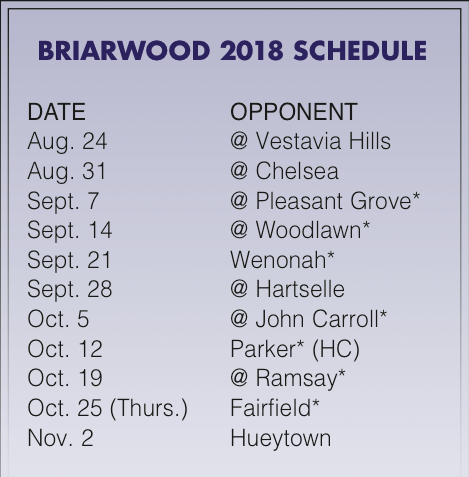 Briarwood will open its season with a jamboree at Vestavia Hills on Aug. 24. The regular season begins Aug. 31 at Chelsea.